Don't Forget... there are 2 challenges that still have lots of time to play. Check out the details! Hey all! Its Katie here with another Tutorial Tuesday and today I've got another great little gift idea for you. I took some things that you might have excess of and then dressed it up a bit! Those 2 things being tea light candles and buttons of course! I must put in a disclaimer here... you will want to be careful when you light these because we are talking about flammable things surrounding your candles. You will want to start out with candles of your choice. These happen to be from one of those candle parties and they come in a variety of colors and scents. I opted for basic white of course. Then you will need some pretty designer paper measuring 5/8" x 5 3/8". Next, all you have to do is apply adhesive to your paper strips and wrap around your tea lights. Originally I had planned on leaving them plain and then adding them to my clear box, but they didn't fit quite right so I needed a way to "bulk" them up... which is where the buttons entered the scene. And of course I have a plethora of buttons! Just attach with mini glue dots and you're good to go. Here are the candles all buttoned up! Packaging is the next step and you can't get any easier than using THESE CLEAR BOXES. You seriously need to keep a stash of these on hand. I used the same size that you would use to package up your standard A2 cards. Before I placed the candles into the box, I cut a piece of sparkle mud pie cardstock measuring 4" x 5 7/8". This became my colored mat. HINT: I always fold my box and make note as to which side my flaps are. I then flip the box over so that those flaps are on the bottom or back depending on how you are using the box. For my outside wrap, I cut some more sparkle mud pie cardstock (12" x 2 1/2"). I scored at 2 1/2", 3 1/2", 8", and 9". For the front part of the wrap, I cut a piece of Toasted Almond cardstock just for the front... I didn't wrap it around. It measures (4" x 2 1/4"). I used the polka dot background stamp - stamped and then stamped again (second generation) to get the faded dots. Used some Melon Spice ribbon to finish things off! And of course, I couldn't possibly go without using the new Designer Label Dies. It will be sad when I can't say "new" anymore (lol). I added the "you're so special" sentiment from Curved Sentiments and then embellished with even more buttons. The circle is a 1 1/4" circle punch. There you have it friends... get to using your supplies :) Thanks as always for coming to visit us here at Clearly iStamp! Enjoy the day. Howdy all, its Katie here to welcome you to another tantalizing, tremendous, terrific, tutorial Tuesday (hehe)... ok, just being a little goofy. So, I'm continuing on with a theme here... do you know what it is? Well, if you didn't know, I've been trying to show you gift items that you can give to your friends and family as well as items that you could sell at craft fairs if you are so inclined. Today's treats are very seasonal, but I do know of a couple of craft events that occur before Halloween so I thought I'd go ahead and share these with you, plus its ALWAYS good to have a few festive treats on hand. The treats I gathered today are favorites here in my household, plus they are so easy to decorate and I always get ooohs and ahhhs from those I give these too. They are just plain cute. The main items that MAKE these projects are the Boo to You and Web Notes Stamp sets... they are perfect for Halloween and make decorating your treats EASY. I started off with super, duper, uber cute 1 1/2" cube box. Seriously, we are talking CUTE!!! I opted to buy the less expensive round mints and they are a tad bit smaller than the other version out there. Well, they fit perfectly in this little cube. I started by stamping an image from the Boo to You set and used a 1 3/8" circle punch to cut them out. Then I used a 1 1/2" scallop punch to cut out the slight border and bottom for my mints. I used Grape Jelly for my scallops. Because I didn't have a lot of size differentiation, I opted to create a bit of color by using my copic marker (YR07 tangelo smoothie) to add a border to my stamped and cut image. For this situation, I used glue dots to put everything together. I added 3 mints to my small cube, but layed them in sideways, folded and then added a bit of ribbon (tangelo smoothie grosgrain). My sentiment was created with the set called Card Categories Too. The box ships nice and flat and of course stores nice and flat until you are ready to use it. My next treat to be "treated" are the "traditional" hershey nugget candies. I love these things and have decorated these for years. If you didn't realize it, THIS clear box fits 8 nuggets perfectly! I used sticker sheets and stamped with the Web Notes set. Again, so easy... fill box and add some pretty ribbon and a great label or tag. I used Spellbinders Ribbon Tags Trio Two and then added these super cute spider brads. I cut the prongs off and then attached them with glue dots. And my last cute treat are candy corn of course. They look so festive in these pillow boxes. Again so simple. I stuffed about 1/2 cup of candy corn in the large pillow box to give you some reference. I used some extra mint covers for my tags. And finally, here are all the treats partying up together. Well, that's it for me here... get those Halloween favorites out and ready to go. 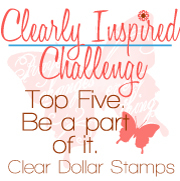 As always, thanks for stopping by and spending some time here at Clearly iStamp. Don't forget that we have a challenge going on right now... click --->HERE<--- for all the details. Christmas Fudge a "secret" recipe. Hi friends, its Katie here to welcome you to another Tuesday Tutorial. Ok, the title today is definitely tongue and cheek and as you scroll down, many of you will be familiar with this great and quick gift and/or CRAFT FAIR item. If this concept is new to you then, yes... you must absolutely keep a few of these on hand for those quick neighbor, office, teacher, etc gifts to give during the upcoming holiday season. The key and fun part of this whole gift is the poem. I have seen this poem all over the internet and I don't honestly know who wrote it but I did find this name associated with it. life is so crazy. Why? but please don't talk too slow. a Christmas gift to eat. For my candy bar wrap, I opted to only use the last little paragraph, shrink, and add it to a tag. So here are your main ingredients. I also picked your basic Hershey Big Bar. They are always (usually) on sale for $1.25 in my area. The easiest part is of course the wrap. Just grab some fun holiday paper and go... I cut mine to measure 6 1/2" x 8 1/2"
I also opted to take the original candy bar wrap off and wrapped right over the foil. Now another thing I like to do is enhance my designer papers. This particular paper had a great snowflake border, but it was going to be hidden on the bottom of my bar so I grabbed a cute little snowflake from the set Heartfelt Sentiments. I stamped several times with just one inking and very randomly stamped layering the image. Then just apply adhesive and wrap. One more wrap with some Spring Leaf Grosgrain ribbon and then the real fun happens. I often seen the entire poem printed onto the front of the candy bar, but I always felt like it hid the beautiful paper underneath so I opted to create a pretty tag for the bar. Plus it gives you a small area to stamp and decorate too. So, I decided to create my tag or actually little book with the Nestabilities - Curved Rectangles. I used the second to the largest size with some Red Velvet Cake Cardstock. Because I didn't want a flat tag, I scored it like below. Measurements worked out perfectly on the Scor - Buddy, but the original Scor-pal would work just as well. Next, I copied and pasted the portion of the poem I wanted and then printed an entire sheet of them. I kept the cut pretty close to the left side of each section of text. I then took the next smallest size of the Curved Rectangles and cut the poem so that the right edge would have the matching curve. Just add to the inside of tag. Next I grabbed the set called Baked for you Tags. I stamped the main image with Spring Leaf and the sentiment with Red Velvet Cake ink... (I thought it would be funny to use that secret recipe sentiment) and then cut it out with a circle nestability. Attach to front of tag. Then I punched a hole in the "binding" of my tag. I opted to do this so that when the tag was attached you could open it easily and read the poem inside without having to bend it open. The tag will still lay flat even it is layered with other bars because of the score marks. Then just attach the tag with some twine to the bow on the candy bar. And there you go! A super fun and easy gift to either sell or give away this holiday season! Thanks for coming to visit us at Clearly iStamp and I wish you a very merry Tuesday.